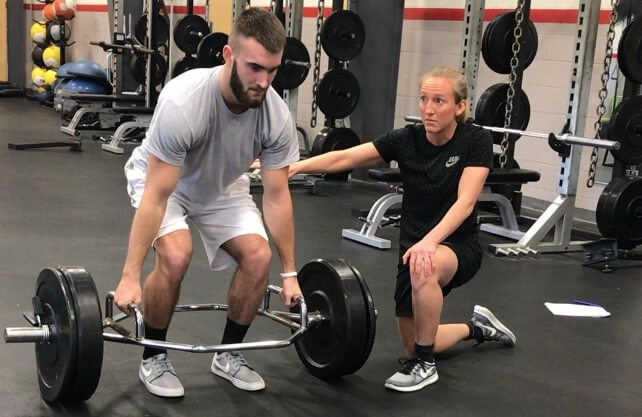 Michelle Boland is the owner of Michelle Boland Training and coaches at Northeastern University Sports Performance. She works with women’s ice hockey, field hockey and rowing, as well as assisting with men’s basketball. Michelle has a bachelor’s degree in nutrition, master’s degree in strength and conditioning, and Ph.D in Exercise Physiology. One thing I take very seriously is when former guests on the show refer me to other coaches and trainers. In this case, the one and only Pat Davidson told me that I should interview Michelle – and let’s be honest, when Pat Davidson tells you to do something, you best do it! In this show, Michelle and I talk about the role and value of what she calls “variability training days,” how to instantly improve your exercise cuing, and her thoughts and solutions to getting more women into the world of physical preparation. How Michelle got started in the world of physical preparation. An overview of her career arc, including her current gig at Northeastern. A peek inside her model, including the differences between performance and health. Breathwork in S&C: How she incorporates it, and how she gets athletes to buy-in. How Michelle strikes a balance between serious training and “rehabby” type exercises. Why you should change up the style of your cuing between big-bang, compound lifts and lighter accessory exercises. Her thoughts on asymmetry, and how it impacts your program design process. An awesome lightning round where we discuss her career highlight as a coach, the books she’s reading right now, her greatest struggle as a female in S&C, and what’s next for Michelle Boland.